Myers Park was developed in a number of stages and portions of the residential neighborhood have been deteriorated by commercial and multi-family construction. Therefore, the irregular boundaries of the neighborhood, as defined by the Homeowners Association, are difficult to describe in a short paragraph. Roughly the area is as follows. Begin at Brunswick Ave and Sugar Creek. Proceed along Sugar Creek to the point where Ridgewood Ave would be if Ridgewood was extended to intersect with Sugar Creek. Follow Ridgewood to Selwyn Avenue and continue on Selwyn to and along Colony Road (including Glendale Avenue, Arcadia Avenue, Winding Wood Lane and Greenbriar Road) to Briarcreek. Follow Briarcreek to its intersection with Providence Road. Go northwest along Providence Road to Dartmouth Pl. and then follow Dartmouth to Queens Road. Follow Queens Road northeast to a portion of Amherst Place (See Amherst article at Page 9). Return to Queens Road and proceed southwest to Henley Place. Follow Henley to Kings Drive. Follow Kings Drive to Brunswick and follow Brunswick to the point of beginning. Lots on both sides of the roadway boundaries are included in Myers Park except for lots east of Providence Road. The following map is our best effort to show graphically the boundaries. 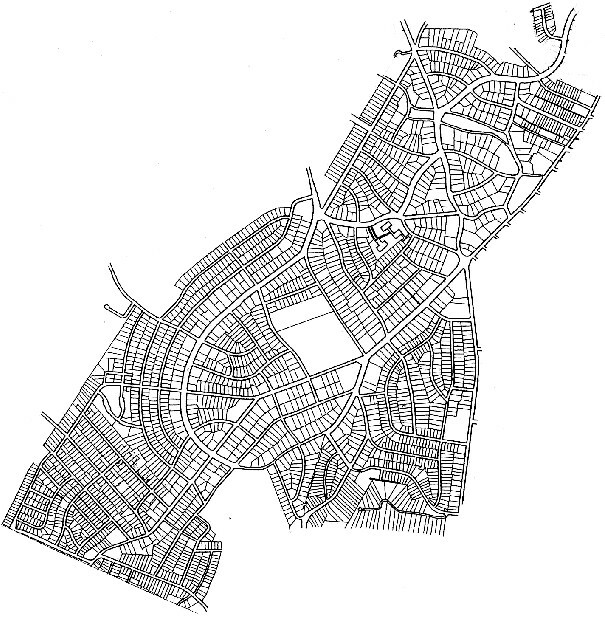 It is difficult to read without street references, but Providence Road is the “V” at the top of the map and the sweeping circle in the middle of the map is Queens Road W and E. If you have a question about a specific property please contact a board member. As we will explain in a later newsletter, the National Historic District Boundaries are smaller than the Homeowners Association boundaries.